Three weeks after Stirling air gunner Doug Fry was reported missing over Germany his mother was still clinging to the vain hope that he was alive. Then a neighbor said she had seen him in the cinema just down the road. The airman and his crew had been filmed for a Bomber Command documentary shortly before they took off from Mildenhall to attack Remscheid. Three hours later four of the crew were killed, but it was another two months after she had also seen the poignant film that widowed mother of eight Winnie Fry knew her nineteen-year-old son, though wounded, was still alive. Lancaster pilot Victor Wood’s aircraft arrived too early over Gelsenkirchen when the target was shrouded in darkness and the Main Force was miles behind. His 12 Squadron bomber was suddenly struck with terrifying force by flak and turned upside-down. An engine was on fire, the unconscious mid-upper gunner, slumped in his turret, was being sprayed with petrol and their bomb-load had been struck by shrapnel. Could Vic Wood get his crew back to base safely? 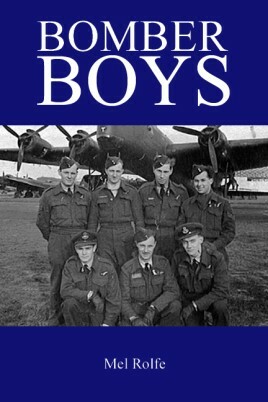 These are just two of twenty dramatic stories from Bomber Command by Mel Rolfe, which is contained in Bomber Boys. Night after night, the young men, some just out of school, went off on sorties, having pushed to the back of their minds the unpalatable awareness that they might never see another dawn. If death did not find them on the first few terrifying sorties they grew up very quickly in order to fight another day.